Lina, Lady Radbourne, thought being a countess would rescue her from poverty. Unfortunately, her young groom failed to plan for the future, and his drunken accident left her widowed and pregnant. Now Colonel Winstead Vaughan—Win—will inherit her late husband's fortune…unless she gives birth to a boy. Win is her natural enemy, so why can't she stop thinking about him? Win is stunned to learn he stands to inherit a vast fortune. He's even more surprised to find himself falling for the beautiful, spirited Lady Radbourne, who is the one woman who stands in the way of a life he'd only imagined. When someone tries to poison Lady Radbourne, suspicion falls on Win. There's a clever killer in their midst, and if Win doesn't solve the mystery fast, Lina may perish. He needs to win her trust, but how can he prove it's she he wants, and not the fortune? Lately I've been forcing myself to try more new historical romance authors, as it's a subgenre I used to love and now I've almost abandoned. Way too many have been unsuccessful experiments, but fortunately, this was one of the rare successes. Lina grew up in an impoverished family. When a young local nobleman became completely besotted with her she decided to accept his marriage proposal and become Lady Radbourne, ending all her financial woes. She didn't love him, but she was fond of him, so it didn't seem very wrong. But not long afterwards, everything goes to pot. Her young husband is, well, young, and he behaves exactly like you might expect a spoilt young nobleman to behave. His foolhardy, risky behaviour ends up with him getting killed trying to win a bet while hopelessly intoxicated. And now the title and his property are going to a cousin, unless Lina is expecting a child and that child is male. And it turns out that Lina is actually pregnant. The problem is that right after the accident, in a conversation in which she was still in shock and the magistrate was being a bit too delicate in his enquiries, she gave him the impression that she wasn't. So when the cousin in question, Colonel Win Vaughan, arrives to claim his property, daughter and teenaged brother in tow, it's a big shock to him to find that his future is not as secure as he'd been given to believe. 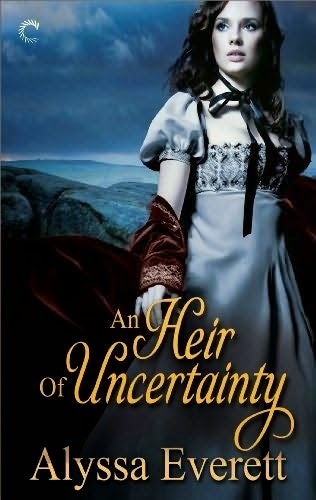 I thought An Heir of Uncertainty was really solid. I liked Everett’s writing, which flowed wonderfully and carried me through. Most of all, I enjoyed the characters and the conflict. Both Lina and Win are sensible, grown-up people, and that's one of the things that attracts them to each other. They're placed in an uncomfortable situation by the circumstances, and it's circumstances that aren't really anyone's fault. All, even the magistrate, behaved reasonably. But rather than set Win and Lina up as enemies who lust after each other (as I thought would be the case afer an inauspicious first meeting), Everett has them push through the mistrust that results and get to know and like each other. I also liked the secondary characters, particularly Freddy, Win's teenaged brother. Freddy is a young man modern readers will most likely recognise as being somewhere on the autism spectrum, with his obsession with pigeon rearing and his difficulties functioning normally in society. Obviously, that's not recognised as such in the time period, and he's just considered eccentric and weird. It's a fond portrayal, and the way Win interacted with Freddy was sweet. The book also has a pretty strong mystery (much as I liked the romance, the internal conflict was not particularly substantial, so having a strong mystery was good). Someone is trying to harm Lina, either by making her miscarry or killing her. Win would be ann obvious suspect, although it seems he's being targetted as well. It was really intriguing, and I enjoyed trying to guess what was going on. Unfortunately, the solution was not quite as good as I’d hoped, as it relied on a certain motivation that just makes me sigh and I didn't find particularly convincing. Still this was good. I'd happily read more by Alyssa Everett.